My research focuses on analyzing media content for disability authenticity. I also produce videos that represent authentic portrayals of individuals with disabilities, these positive portrayals have the potential to improve attitudes toward people with disabilities. “I am … Abled” is one of those videos. Shot in 2011 at University of Texas at El Paso, it features three students with disabilities: Isaac is blind, Elisa has the autoimmune disease lupus, and Joann has cerebral palsy. As a mixed-methods researcher, I utilize both quantitative and qualitative methods and a variety of approaches. For example, I use several media-based approaches to tackle issues pertaining to prejudice and stereotyping in all settings, specifically looking at physician/patient prejudice and miscommunication. I have also used the positive deviance approach, media literacy, entertainment education, and the health belief model to look at institutionalized prejudice and prejudice reduction. Additionally, I frequently incorporate advanced quantitative methods in my scholarship to examine indirect, conditional, and reciprocal effects of media messages on attitude and behavior outcome variables. My current research focuses more the creation and implementation of media messages in changing behavior. I am currently a Research Assistant with the Collaborative on Health Reform and Independent living (CHRIL). The CHRIL is funded by a 5-year Disability and Rehabilitation Research Program (DRRP) from the National Institute on Disability, Independent Living, and Rehabilitation Research (NIDILRR grant number 90DP0075-01-00). The CHRIL brings together disability advocates and researchers from 4 institutions (Washington State University, the University of Kansas, George Mason University, and the Independent Living Research Utilization program at TIRR Memorial Hermann Hospital) to systematically investigate and disseminate essential findings about how the Affordable Care Act’s implementation affects working age adults with disabilities. In my capacity as a CHRIL research assistant, I have worked on Center grants and I am the coordinator for the Disability Stories Project which is a virtual story bank of people with disabilities and their experiences with health insurance and health policy. The project helps us to conceptualize how health insurance impacts peoples choices about participating in disability programs or working. Kallman, D. (2017). Integrating Disability: Boomerang Effects when using Positive Media Exemplars to Reduce Disability Prejudice. International Journal of Disability, Development and Education, 64(6), 644-662. doi: 10.1080/1034912X.2017.1316012. Hewa, J., Kallman, D., & Peterson, J. C. (Under Review). Teaching Change by Changing Teaching:Introducing Communication for Social Change through Empowering Pedagogy. Communication Teacher, Critical Communication Pedagogy and Social Change. Kallman, D. & Funaiole, A. (Under Review). Perception and acceptance of the meningitis vaccine and booster among college students: An Application of the health belief model. Journal of Health Communication. Kobzar, I., Kallman, D., & Stefani, W. (2017). Navigating with disabilities in the U.S. healthcare system. In D.Baker (Ed. ), Disability and U.S. politics: Participation, policy, and controversy (Volume 2). Santa Barbara,CA: ABC-CLIO. Austin, E. W., Kallman, D., & Kistler, M. (2017). Media-Literacy approaches for improving youth and family health. In B. De Abreau, P. Mihailidis, A. Lee, J. Melki, & J. McDougall (Ed. ), The International Handbook ofMedia Literacy Education. London: Routledge. Dura, L., Kallman, D., Boyd, C., Ayala, P., Diaz, A., Molinar, J., Singhal, A. (In Publication). Positive deviance as action-based research: Tackling complex social problems on the US-mexico border. In A. Singhal (Ed. ), Positive deviance: A new paradigm for social, organizational, and behavioral change. Kaiser, C. K., Kallman, D ., & Bailey, R. L. (2015). Seeing uncertainty: Investigating the role of visibility in the processing of disability. Psychophysiology, 52, Supplemental Issue 1, S108. Austin, E W., Shultz, J. Armstrong, Cohen, M., Parker, L., Calodich, S., Price, C., Viebrock, M., Lain, M., Kistler, M., Kallman, D. et al. (2014). Audience-Driven Curriculum Design to Enhance Youth and Parent Media Skills and Food Behaviors: Year 2 of 5. Journal of Nutrition Education and Behavior, 46, 4 S189. Carroll, M., Paveglio, T., & Kallman, D. (2013). Exploring local perceptions and attributions of “extreme” wildfire impacts in Rural Montana. American Geophysical Union Fall Meeting. San Francisco, CA. Austin, E., Dean, M.K., Austin, B., Kaiser, C.K., Kallman, D., Edwards, Z., Stefani, W., Kistler, M., Cohen, M., Johnson, B., Parker, L., & Power, T. (2018, July). 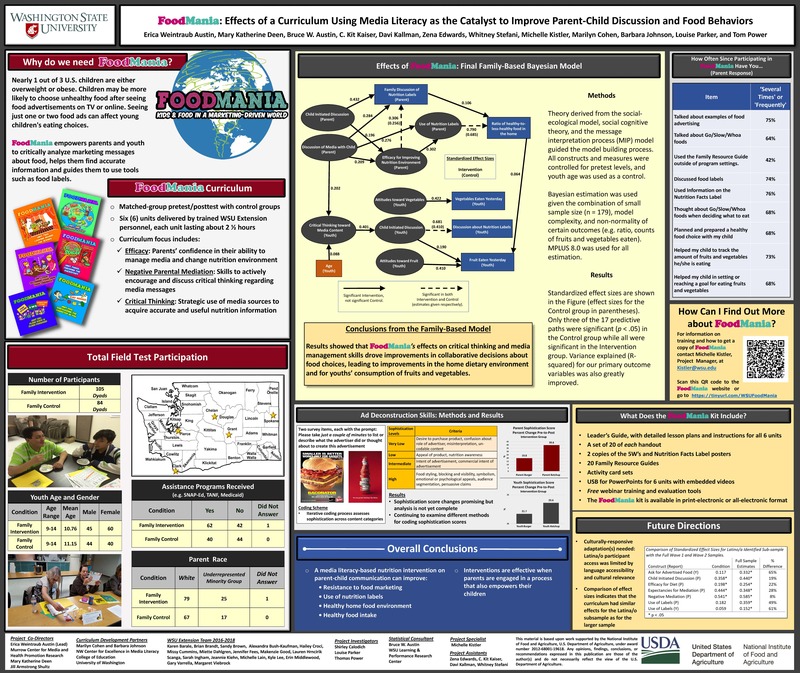 Foodmania: Effects of a curriculum using media literacy as the catalyst to improve parent-child discussion and food behaviors. Poster presented at the Society for Nutrition Education and Behavior (SNEB), Minneapolis, MN. Edwards, Z., Brandt, C., & Kallman, D. (2018, May). FoodMania: Kids & food in a marketing driven world. Poster presented at the National Health Outreach Conference, Bloomington, MN. Bailey, R., Brown, J.R., Kaiser, C.K., & Kallman, D. (2018, May). Signaling uncertainty: Visible disabilities as an honest signal. Paper presented at the international Communication Association, Prague, Czech Republic. Kaiser, C.K., Austin, E. W., Power, T., Kistler, M., Austin, B., Edwards, Z., Kallman, D. (2017, November). Nutrition focused media literacy empowers families to make healthier food choices in a marketing saturated environment. Paper presented at the American Public Health Association (APHA) Annual Meeting, Atlanta, GA.
Kallman, D., Kistler, M., Kaiser, C.K., Austin, E.W. (2017, November). Exploring participant engagement in a supplementary facebook curriculum. Poster presented at the American Public Health Association (APHA) Annual Meeting, Atlanta, GA. Awards: Outstanding Student Abstract. O’Donnell, N., Kallman, D., & Stefani, W. (2017, August). Instagram as a tool for communicating sexual health: Future recommendations and unanswered questions. Paper presented at the Association for Education in Journalism and Mass Communication, Chicago, Illinois. Austin, E. W., Deen, M.K., Cohen, M., Johnson, B. K., Kaiser, C.K., Austin, B., Kistler, M., Edwards, Z., Kallman, D., Power T., Parker, L. (2017, July). Stage 2 field testing of a family-based media literacy and nutrition program to prevent childhood obesity. Poster presented at the Society for Nutrition Education and Behavior, Washington, DC. Kallman, D., Kistler, M., Kaiser, C.K., & Austin, E.W. (2017, July). Exploring participant engagement in a supplementary Facebook component to the FoodMania curriculum. Poster presented at the Society for Nutrition Education and Behavior, Washington, DC. Kallman, D. & Hewa, J. (2016, June). Teaching change by changing teaching: Introducing participatory methods of teaching in graduate and undergraduate seminars. Poster presented at the International Communication Association, Fukuoka, Japan. Austin, E., Muldrow, A., Kallman, D., & Pinkleton, B. (2016, June). Exploring the associations across adolescence of perceived desirability for alcohol advertising and skepticism about advertising . Hybrid poster and paper presented at the International Communication Association, Fukuoka, Japan. Kallman, D. (2015, March). Breaking the language barrier in intercultural communication: Speech codes theory and Everything is Illuminated . Paper presented at the Popular Culture Association and American Culture Association 2015 Annual Conference, Seattle, WA. Kallman, D. & Hewa, J., (2015, November). Teaching change by changing teaching: Introducing communication for social change through empowering pedagogy . Paper presented at the National Communication Association Annual Conference, Las Vegas, NV. Kallman, D. (2015, November). Life without boundaries: A positive deviance inquiry of communication behaviors that influence academic success of learning disabled university students . Paper presented at the National Communication Association Annual Conference, Las Vegas, NV. Kaiser, C.K., Kallman, D., & Bailey, R. L. (2015, October). Seeing uncertainty: Investigating the role of visibility in the processing of disability . Poster presented at the Society for Psychophysiological Research 55th Annual Meeting, Seattle, WA. Kallman, D. (2015, August). Integrating disability: Increasing and improving the portrayal of people with disabilities with positive media images . Poster presented at the Association for Education in Journalism and Mass Communication, San Francisco. Kallman, D. & Funaiole, A. (2015, May). Perception and acceptance of the meningitis vaccine among college students. Paper presented at the International Communication Association Annual Conference, San Juan, PR. Austin, E W., Shultz, J. Armstrong, Cohen, M., Parker, L., Calodich, S., Price, C., Viebrock, M., Lain, M., Kistler, M., Kallman, D. et al. (2014, June). Audience-Driven Curriculum Design to Enhance Youth and Parent Media Skills and Food Behaviors: Year 2 of 5. Poster presented at the Society for Nutrition Education and Behavior National Conference, Milwaukee, WI. Tan, A., Alghaithi, S., Curtis, C. Kallman, D., Liang, C., Moody, C., Pande, S., Sauerbier, R., Stuart, K., Yang, C., & Zearott, S. (2014, August). Effects of mediated exemplars on implicit prejudice toward Hispanics. Poster presented at the Association for Education in Journalism and Mass Communication Annual Conference, Montreal , CA. Carroll. M.S.,Paveglio, T., & Kallman, D. (2013, December). Exploring local perceptions and attributions of extreme wildfire impacts in Rural Montana. Paper presented at the Fall Meeting of the American Geophysical Union, San Francisco, CA.